Audi has unveiled the Audi TT ultra quattro concept – which combines minimal weight and maximum sportiness at Worthersee tour in Austria this week. 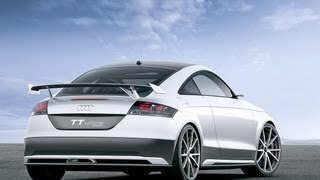 The concept car is based on the Audi TT S quattro. Together with the optimized detachable body parts, use of carbon-fiber reinforced polymer (CFRP) and Magnesium componenets, the result is the impressive weight loss of about 300 kg (661 lbs). The combination of lightness and sportiness is also reflected in the looks. 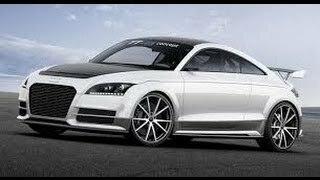 The Audi TT Ultra Quattro Concept is painted in the special color crystal white. The CFRP used on the exterior adds a striking touch on the hood, the roof, the sides and the trunk. In the interior the same material also adorns the door trim, the center console and the cross-bracing that replaces the rear seat bench. The developers have also fitted the bucket seats from the R8 GT to the concept study. 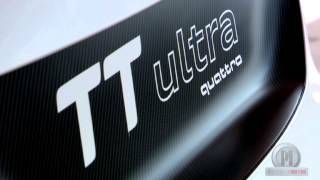 The TT Ultra Quattro Concept car is powered by a four-cylinder, 2.0-liter TFSI engine producing 310 HP (228 kW) and 295 lb-ft (400 Nm) of torque. With a power-to-weight ratio of 3.6 kg/HP, the sportscar is able to reach 100 km/h (62 mph) from a standstill in only 4.2 seconds (1.3 seconds faster than the series-production model) and is capable of reaching a top speed of 280 km/h (173 mph).